Ross Vertical Blenders are ideal for low shear blending of powders, pellets, granules, fibers and other solids. These blenders feature an auger that turns on its own axis and a mechanical arm that rotates the auger around the conical vessel. The mixing action in a Vertical Blender is far gentler than that of ribbon, paddle or other horizontal blenders, making it more suitable for delicate and abrasive applications. Spray nozzles may be installed for liquid addition and coating purposes. 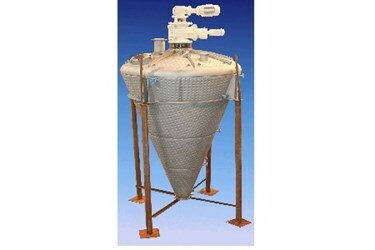 Vertical Blenders are also commonly used in vacuum drying operations and can accommodate a wide range of feed forms including slurries, wet cakes, pastes and flowable solids. 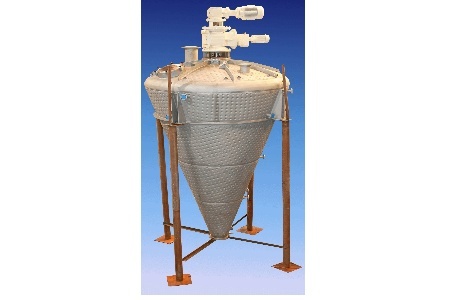 Requiring only low heat to drive off moisture or solvents, vacuum drying in a Vertical Blender is an excellent method for drying heat-sensitive materials without fear of thermal degradation. Other processing advantages include low energy consumption, fast drying rates and effective solvent recovery. An important design feature that is standard on all Ross Vertical Blenders is the absence of a bottom support bearing which facilitates complete discharge, simplifies cleaning and lowers the risk of batch-to-batch contamination. This design also allows the machine to be operated with very little maintenance. Many standard sizes from 1 through 500 cu.ft. capacities are available. Shown is a 350-cu.ft. Ross Vertical Blender designed for full vacuum up to 30 psig internal pressure at 300oF. It is equipped with an ASME 50-psig stainless steel jacket and explosion-proof motors to drive the screw (25 HP) and swing arm (1.5 HP).